The Vision Deep reels have a deeper arbor giving you plenty of capacity for your lines. Vision have also provided a reliable and smooth disc brake with easy and accurate adjusting. Deep fly reels are strong but still lightweight, thanks to Vision's the latest die-cast techniques and materials. 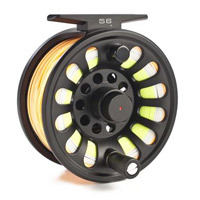 Their nonreflecting matte finish and reliable, XLA style spools quick release are something you wont be used to finding from reels at this price level before.